only he who is done learning grows old. Thus, in order to preserve your youth (and your bounce! 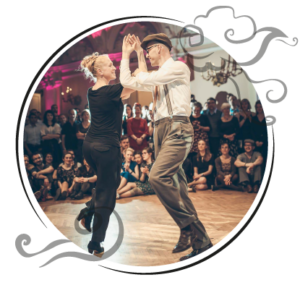 ), six of the greatest swing dancers will be your teachers, all imbued w ith wisdom, joy, and folly. It’s been 5 years already since their last stay in Grenoble, but this time, Albert is back with an amazing and passionate partner: Susana! Since birth, Susana Bernal Sanchez has been immersed in all kinds of musical environments, thus acquiring very eclectic musical tastes and an always stronger open-mindedness. 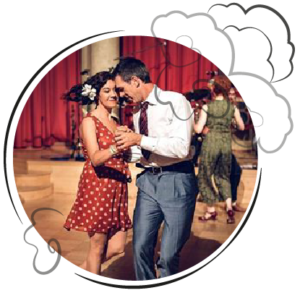 It is in 2002 that she makes her first foray into the dance world through salsa, and in 2004 dance fever takes complete hold as she discovers Argentine tango! For 6 months, she trains intensively alongside some of the world’s best tango dancers in Buenos Aires. After that and until 2007, she is Pablo Tegli’s pupil, one of the leading figures of “Nuevo Tango”, with whom she teaches from time to time at Tangueando Toulouse, in France. 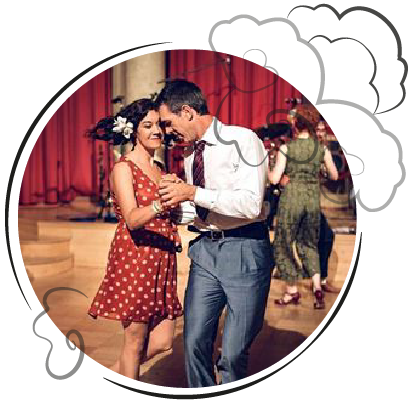 She discovers swing dancing in 2006 at Toulouse’s Studio Hop, where Anne-Hélène and Bernard are her teachers. Very soon after that, she starts traveling around Europe and in the United States in order to improve her technique and keep up with the rapid evolution of the swing dancing scene, and it is very naturally that she started teaching these dances which resonate strongly with her heart and mind! Albert Ferran has been dancing Balboa since 2005 and he teaches internationally since 2011. His passion for this dance has made him one of the driving forces behind the creation and growth of a community of Balboa dancers in Barcelona, which is increasing day by day. He has developed his own style with a particular way of combining Pure Bal and Bal Swing being very musical. He has won different international Balboa competitions such as the Eurobal Cup in 2011 the BOTP Classic Open in 2013, and the Easter Balboa Championships 2013, was second in the Open Social of the ABW 2017 in Clevelandand and first at the CalBal Classic 2018 Open Mixed Couples. After visiting a History dance-lesson of balboa in Toronto 2009, Anni Skoglund knew that this was her new favourite dance. With a degree in Occupational Therapy Anni has a deeper understanding in how to help people reach their full potential in activity. Combining this with teaching dance is an ongoing and interesting journey. Within the dancing, her focus is the true feel, emotion and communication of the couple, led and inspired by harmony of swingin’ rhythms. Gašper Hrovat is a gentleman and a classy dancer with lots of positive attitude, enthusiastic mood and inspiration. His form of dancing lays in vintage jazz dancing from 1920’s on. Gasper loves to help you find inspiration and visualise the music through the dance. The music is a central part of Gaspers interest for the history of Balboa and jazz. Ask him questions or let him Dj and you are in for a journey. 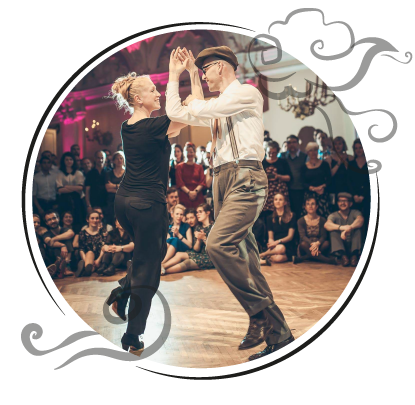 We’re delighted to welcome for the first time this inspired and charming couple, raising stars of the swing dancing scene! Abigail Browning tombe amoureuse de la grâce et de l’athlétisme des danses swing en 1998, et elle n’a cessé d’étudier les techniques et l’histoire du Lindy Hop, du Balboa et du Charleston depuis. Elle a appris le piano classique dans son enfance, et cherche à exprimer les subtilités et la jubilation du jazz dans sa danse. Poétesse et titulaire d’un Master en Écriture Créative, Abigail aime utiliser des métaphores lorsqu’elle enseigne. Elle cultive la créativité et la musicalité, tant pour les follows que pour les leads, et met l’accent sur la maîtrise du corps à travers des exercices d’équilibre, la répétition, et l’isolation des mouvements, le tout dans la joie et la bonne humeur, et sans perdre de vue le contexte historique des danses qu’elle enseigne.